Bonaire’s reef is in fantasic shape. It has been a national park for many years and has flourished under the protection of the law. Everything is in abundance. In fact it is hard to find those special things because there is so much of everything. One animal does stand out. There are so many one becomes complacent about them about 5 minutes into the first dive. The only thing is there are so many you cannot ignore them. There are Spriobranchus Giganteus on every square foot of reef on the west shore of Bonaire. 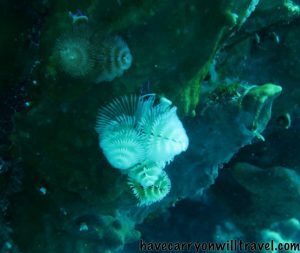 The Christmas Tree Worm, its common name, is a tube building polychaete worm. It has two conifer like crowns consisting of radioles, hair like arms radiating from the worm’s central body. Once these fellows find a home they tend to stay. 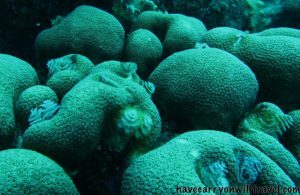 They bore a hole into living coral and lay down roots (figuratively). They are quite shy and will retract crowns and all into their tubes when they are disturbed. The largest of them is about 1.5″ in diameter. They come in a variety of brilliant colors and are easily spotted when swimming by. 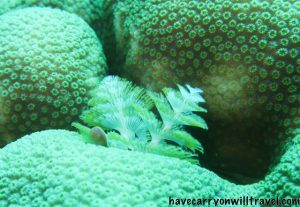 Christmas Tree Worms are one of the most widely recognized of the marine burrowing, segmented worms. We keep thinking we should mention these guys in our blog so today we decided to give them a dedicated expose. Hope it is something you can use in your everyday conversation tomorrow. 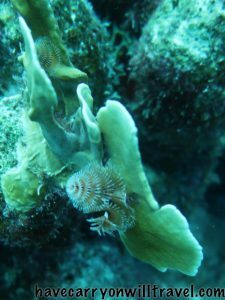 This entry was posted in Bonaire and tagged Bonaire, scuba diving, shore diving. Bookmark the permalink.